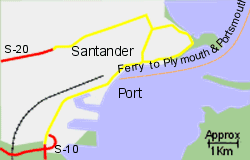 Map of the Santander Ferry Port area. Located in a large natural harbour on the north coast of Spain, the ferry port of Santander, on the edge of Santander city, is important for communication with the UK. 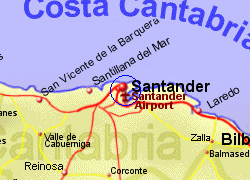 Santander airport lies approximatley 4km from the ferry port and the main train station is around 400m away, where there is access to fast Alvia Trains heading south to Madrid. 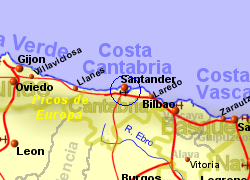 From Santander, you will find a motorway heading east or west along the coastline, the E-70, which can get busy at times near the city. 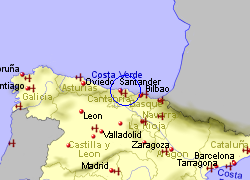 If you are heading south Burgos, it will be an ordinary road that is adequate, the N-632. The first section is quite windy and it is a long haul uphill if you are heavily laden or towing a trailer. Operated by Brittany Ferries, 2 crossings per week, crossing time 24 hrs.